What happens when your cutlery is as long as your arm? Are fingernail trimmings a measure of time? Would you wash your friend’s feet? Societal and cultural conventions establish limits, defining who and what is acceptable, and who and what belongs. Objects are integral to these conventions, either in typology or aesthetics, reflecting or reinforcing them. They may reflect beauty standards; they may be associated with class, race, or gender; they may dictate our interactions between each other, or between ourselves and other objects. But if design can reinforce these ideals, they can also provide alternatives. 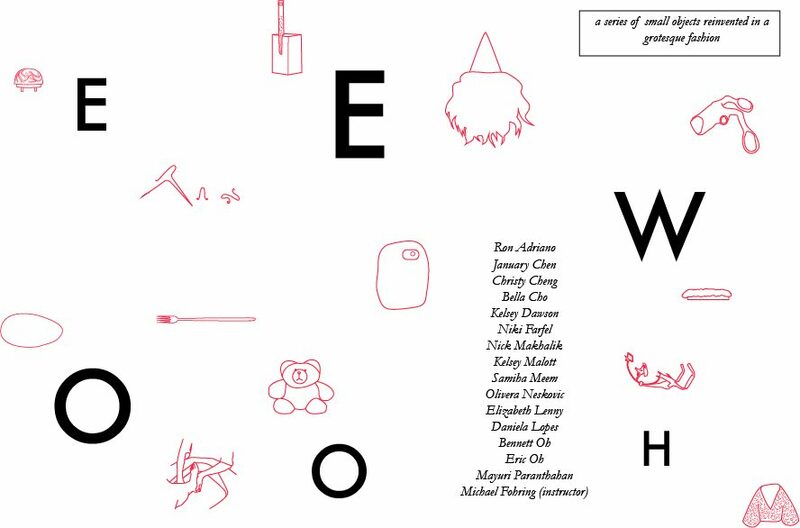 Eew-ooh is a collective of University of Waterloo Architecture students testing this possibility through examining what the term grotesque could mean today. Through ambivalence and play, the grotesque has the power to corrupt standard assumptions and make the boundaries between normal and abnormal fluid. By re-thinking or inventing a series of small usable objects in true grotesque fashion, the study explores how design can challenge and crack open a number of socio-political, cultural, and disciplinary issues that we are passionate about. By embracing the bizarre, ugly, or comical, perhaps the grotesque can point towards a more open and jolly way of being with and among one another.